So thanks to another midweek getaway–the last one for a while, I promise*–it’s been a few days since we recapped the goings-on at Auburn’s spring camp. Which is a shame, since there’s a ton to report. — It’s not strictly spring-related, but nonetheless the biggest headline of the last few practices came across just a few minutes ago, as Chizik confirmed that Shon Coleman has a “serious medical issue” that Coleman’s mother’s Facebook (!) identified as a form of leukemia. The good news is that Coleman’s form has a high cure rate and that he’s already started treatment. Bad news? Aside from the fact of leukemia, there is no bad news; football has nothing to do with this story. Here’s wishing (and praying) Coleman a quick and full recovery. 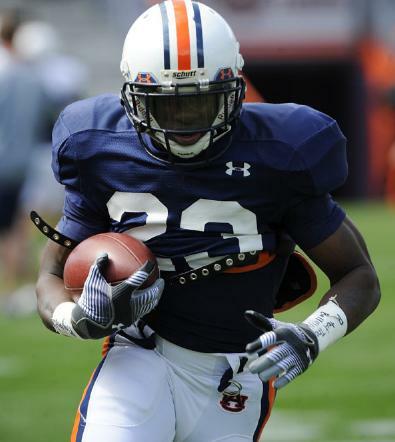 — Daren Bates revealed that he played half of last season with a torn labrum he’d decided not to tell Auburn’s trainers about. On the one hand: good golly. We already knew Bates had tremendous instincts, hitting ability, and durability; but it turns out he has play-every-snap-against-Northwestern-with-a-torn-labrum-grade toughness as well? Whoa. If he stays healthy, there’s zero doubt that Bates has All-SEC written all over him. But here’s the other hand: his best chance at staying healthy, long-term, is telling Auburn’s trainers about things like, I don’t know, a torn labrum. Auburn desperately needed Bates on the field last fall (imagine if Bates, too, had been on the sidelines down the stretch) but we need him on the practice field, now, too, learning his new position at full speed instead of just going through drills. Here’s just hoping it’s not a habit. — Mike Berry’s surgery will keep him out for the duration of spring. I don’t think this is actually a chance for Bart Eddins to steal away the starting left guard job–25-plus career starts for Berry vs. one for Eddins speaks louder than anything Eddins can do, I’d say–but with Eddins getting every starting rep this spring there’s no question who the first guard off the bench is going to be should Berry or Byron Isom miss time. It also might not be impossible for Eddins to impress Grimes to the point that Isom gets bumped to tackle, especially if Roszell Gayden and Brandon Mosley flail through the rest of spring into the fall. That’s highly, highly unlikely of course … but maybe not impossible. — Speaking of Gayden and Mosley, they came in for the standard “they’re working hard, look great but need to learn the system” praise from Malzahn and Grimes. Malzahn also dished out the mandatory “they look a lot better than they did last year” compliments for the quarterbacks, which, I mean, it’s Year 2, three of the four are in their second year of the system, and the guy who wound up the ’09 starter wasn’t even competing last spring; if they don’t look a lot better, something’s seriously wrong. 2. Freeman wasn’t as “humble” as he could have been last season and didn’t entirely tap into that potential. So, yeah, big things ahead. But also some worrying things about last year, I guess. — Speaking of: Freeman and Craig Stevens have swapped sides, with Stevens now on the weak side and Freeman on the strong side. Apparently this gives Freeman more of a coverage role and Stevens more of an “in the box” role, which seems to run counter to each player’s strengths. But Roof wants more versatility and there’s still plenty of time to figure out if it works or not, so we’ll see what happens. — Roof also said Craig Sanders and Jessel Curry have “a million miles to go.” OK then. — I don’t blame any of you for rolling your eyes when I tell you Trooper Taylor’s saying really nice things about DeAngelo Benton again, but I dunno, saying “he’s as reliable as Adams and Zachery” still seems important. Guess we’ll all find out at the spring game, won’t we? In any case, it seems Benton has passed Q. Carr as the No. 3 outside receiver. Then again, it seemed last summer like Benton was a lock to start, so who knows. In the slot, Phil Lutzenkirchen has the TEish spot locked up–at least, before he sat out today’s practice for what may have been a concussion–while Emory Blake, Jay Wisner, Kodi Burns, and Derek Winter all claw for the non-TE slot spot. I’m rooting for Kodi (aren’t I always?) but you have to think the smart money’s on Blake, who also pops up on Tate’s mini-depth chart at the TE spot. — Still a horde of potential punt and kick returners fielding, uh, punts and kicks. The most noteworthy candidate: Eric Smith, at punt returner? OK. As long as he can catch the ball, works for me. — Finally, Ryan Shoemaker had a solid practice this morning booting the ball. Better news than the opposite. *Santa Fe and Taos this go-round. I recommend both. And seriously: sorry about the erratic content of late. You’re getting your usual diet of two posts per-weekday for at least the next couple of months. Cross my heart. I hope the trainers really did not know about Bates’ torn labrum, but I have to admit that seems suspicious to me. Isn’t it there job to know these things? How does Bates know, and the staff/doctors/trainers not know? I know it could be possible, but seems a bit sketchy. PS, Thanks for the updates! I love seeing them, and glad to know you had a good vacation, everyone deserves a few of those every year!